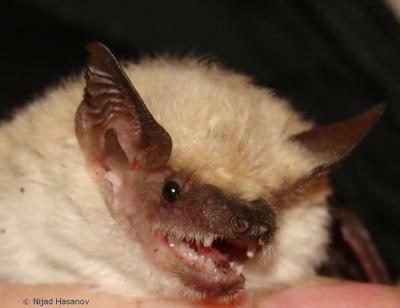 With a wingspan of 310-360 mm, Bottae's bat is slightly smaller than E. serotinus. Its dorsal fur is pale grey, which contrasts with the black face and ears. The species occurs in semi-arid habitats as well as lowland farmland and it roosts in natural crevices, ruins and buildings. E. bottae can be found in the eastern Mediterranean and around the margins of the Arabian peninsula down to Iraq, Iran and the southern Caucacus states. The species range also includes central Asia, India, northwestern China and possibly Mongolia. No major threats present except the decreasing number of ruins and increasing disturbance by tourists.